The C219, sold as the CLS "4-door coupe", was introduced as a niche model in 2005, and is based on the W211's mechanical package. Launched in 2002 for the 2003 model year, the W211 E-Class was another evolution of the previous model. Before North American sales began, the car was shown in the 2002 movie Men in Black II. The W211 development program began in 1997, followed by design work. The final designs were chosen in 1999 and German patents were later filed on December 18, 2000 utilizing an E500 prototype. Development ended in 2001 after 48 months of development at a total cost €2 billion euros. Pilot production went into testing in the summer of 2001, the W211 E-Class debut at the Brussels Motor Show in January 2002. The W211 looked similar to the previous generation, but with a more modern and polished design. The third generation E-Class debuted at the 2002 European Motor Show Brussels featuring twin-headlights, angled slightly rearward. The 2002 E-Class was larger than its predecessors while offering less interior space, particularly in the estate version, than the W210 it replaced. It offered gasoline or diesel engines with a choice of rear or 4-wheel drive. Mercedes-Benz claimed to have reduced the fuel consumption of the new E-Class by up to 0.9 litres per 100 km compared with the outgoing model though the official figures for some models were worse than the predecessor. The on-board computer of the W211 was more accurate than that of the W210 as it took into account stationary periods: consequently the W211 showed consumption of 7 to 10 mpg worse. In fact the cars use roughly the same amount of fuel. The redesigned 2002 model featured electrohydraulic braking system Sensotronic Brake Control (SBC), which was standard equipment in the E-Class, as well as the multicontour seat and the AIRMATIC DC (Dual Control) air suspension system. The multicontour seat automatically adapts to the current driving situation, while the air suspension uses microelectronics to control both springing and damping. Airmatic was standard equipment in the top-of-the-range E500 V8 model and was available as an option on all other E-Class models. The W211 is a more complex car than its predecessor with a programmable serial bus and many automated systems. The 2002 E-Class was manufactured in a 4-door sedan or 5-door station wagon body style; the three existing equipment lines – Classic, Elegance and Avantgarde – continue as before, offering different features to meet varying customer requirements. The W211 is also the first E-Class since 1985 that is equipped with two windshield wipers. The transmission options were 5 or 7-speed automatic or 6-speed manual. The manufacturer's cylinder options were V6, V8, with up to 24-valves, and the Inline-4 or Supercharged Inline-4. Engine outputs of the E240 and E270 models had both risen 5 kW to 130 kW, while the E500 borrow the 225 kW 5.0-litre V8 from the S-Class to supersede the E430. The E320 remained unchanged, with the V6 pumping out 165 kW of power. The E320 CDI used the 3,222 cc (3.222 L; 196.6 cu in) in-line 6-cylinder diesel engine, OM648, that made 204 PS (150 kW; 201 hp) at 3,800 rpm and 500 N⋅m (370 lb⋅ft) at 1,600–2,800 rpm. Engines were updated as a part of facelift (2006) process and new 320 CDI was a 2987 cc V6 delivering 224 hp at 3,800 rpm. The E400 CDI used Mercedes-Benz's OM628 3,996 cc (3.996 L; 243.9 cu in) V8 diesel engine, that made 260 PS (191 kW; 256 hp) at 4,000 rpm and 560 N⋅m (413 lb⋅ft) at 1,700–2,600 rpm. The second generation E55 AMG debuted in September 2002 at the Paris Motor Show. It debuted as the fastest production sedan in the world. The E55 AMG was also offered in an estate version for later model years. The E55 AMG is powered by the M113 ML55 engine, a 5.4 L V8 with a Lysholm type supercharger manufactured by IHI. The E55's engine won International Performance Engine of the Year for 2003. The E55's engine, although the same as the one in the SL55 AMG, had less horsepower, at 476 PS (350 kW; 469 hp) and 516 lb⋅ft (700 N⋅m) of torque. The difference in power is due to a smaller-diameter, longer-length exhaust system in the E55. E55's came with an AMG tuned Airmatic suspension with 3 different driving modes as well as the ability to significantly raise the car. The E55 features 14.2 inch (360 mm) cross drilled disc brakes at the front with 8 piston calipers. The rear brakes consist of 13 (330 mm) inch discs and 4 piston calipers. The E55 came with 245/40/18 tires up front and 265/35/18 in the rear with performance tires on the standard AMG 18" split spoke wheels. Car and Driver reported in their testing that the E55 AMG was faster than the SL55 AMG. The E55 AMG was the fastest four door car in Mercedes-Benz's lineup at the time, and easily outperformed its rivals. While the E55 could accelerate from 0-100 mph (161 km/h) in 9.8 seconds, it took the Audi RS6 11 seconds. The E55 was the fastest production sedan available until Mercedes-Benz released the S65 AMG. However, Car and Driver criticized the brakes on the E55, chastising them for being difficult to modulate, and said that the car as a whole felt 'aloof'. Car and Driver also tested an E55 AMG Wagon, which weighs 256 lb (116 kg) more than the sedan. They found that it accelerated from 0-60 mph (0-97 km/h) in 4.1 seconds and 0-100 mph (0-161 km/h) in 9.7 seconds. The E55 was a sales success, being the best selling AMG until the release of the C63 AMG. The much-mechanically improved, facelifted version, had a new upright grille and a new front bumper. The W211 was updated in 2006 for the 2007 model year, to address quality and technical issues raised by earlier models. There was new standard and optional equipment, which enabled the W211 to hold its own against its competitors. Sensotronic was dropped due to customer complaints about its software, while Pre-Safe (w/o autonomous braking) was made standard. The announced vehicle was unveiled at the 2006 New York International Auto Show. In total, 29 model variants were available, with 16 Saloons and 13 Estates. New standard equipment included PRE-SAFE active protection, NECK-PRO head restraints, flashing brake lights, tyre pressure monitor. The optional Intelligent Light System included bi-xenon headlamps and 5 different lighting functions. The bodies were restyled including the front grill, rear view mirror, redesigned headlamps, front spoiler, rear lights and steering wheel. Coinciding with the minor model update, the largest factory built engine in the E-class range, the E500 (badged E550 in some countries), had its engine size increased from 5 litres to 5.5 litres in 2006. The E63 AMG was the refreshed high-performance model of the W211, replacing the E55 AMG. Besides the Saloon, it was also offered in the Estate body style similarly to the E55 AMG estate model to compete with the new wagon versions of the BMW M5 (E61) and Audi RS6 (C6), though those two high-performance wagons were never sold in North America. This engine had a high-pressure die-cast alloy cylinder block with twin-wire arc spray coated running surfaces. Compression ratio is 11.3:1. According to many auto journalists, the E63 AMG was one of the quickest production sports sedans in the world. Both the sedan (saloon) and wagon had a 0–60 mph (97 km/h) acceleration time of 4.3 seconds. Compared to the previous E55 AMG, the E63 AMG had more horsepower but less torque, enabling it to be mated to the newer 7G-Tronic automatic transmission. While the E500 and E550 had the standard Mercedes Airmatic DC suspension with adaptive damping, the E63 AMG had the AMG-tuned Airmatic suspension which with the stability control turned off gave it far better driving dynamics than its non-AMG predecessors. The AMG Performance package P030 added electronic speed limiter deletion, limited-slip rear differential, Alcantara sports steering wheel, stiffer valving Airmatic suspension over the standard AMG tuned Airmatic, AMG 18 in (457 mm) 5-spoke multi-piece wheels, and optional AMG carbon fibre trim. The E-Guard was an armoured version with category B4 protection level. Engine choices included E320 CDI, E350, and E500. The vehicles were reinforced with steel and aramid. Other safety equipment included Michelin MOExtended run-flat tyres with pressure loss warning system. All models had a top speed of 240 km/h (150 mph). Commonrail Direct Injection with a 7G-Tronic automatic transmission, launched in the USA as the E320 BlueTEC in 2007 and in Europe as the E300 BlueTEC in 2008. The W211 never had a urea injection system throughout its production. The Bluetec name was only adopted to have consistency between the petrol and diesel nomenclature. E 300 BlueTEC was sold as E 320 BlueTEC in US, Canada. E 500 was sold with 5.0L in US, Canada for 2003–2006, and as the E 550 with 5.5L after 2007. E 280 4MATIC was sold as E 300 4MATIC in Canada. On 19 December 2008, Mercedes-Benz announced it had delivered 1.5 million units of W211 E-Class vehicles, with 1,270,000 sedans and 230,000 wagons. ^ "DaimlerChrysler moves to Pekan". New Straits Times / Google News Archive. 17 October 2004. Retrieved 3 May 2015. ^ "E-Klasse Men in Black 2 PROMO". YouTube. 2007-01-03. Retrieved 2012-01-06. ^ "E-Class in 'Men in Black II'". Worldcarfans.com. Archived from the original on 2012-06-15. Retrieved 2012-01-06. ^ ""Men in Black II, 2002": cars, bikes, trucks and other vehicles". IMCDb.org. Retrieved 2012-01-06. ^ "2003 Mercedes-Benz E-Class". World Car Fans. Archived from the original on 2013-07-31. Retrieved 2012-09-29. ^ "DPMAregister – Designs – Registerauskunft zum Design". ^ a b c d e f Lacy, GoAutoMedia - Justin. "Future Models - Mercedes-Benz - E-class - Range". goauto.com.au. Retrieved 14 April 2018. ^ a b c "Mercedes-Benz W211 is First Produced". World History Project. ^ "2007 Mercedes-Benz E320 BLUETEC – Test drive and new car review – 2007 Mercedes-Benz E320 BLUETEC". Cars.about.com. 2011-06-16. Retrieved 2012-01-06. ^ Kiino, Ron. "Mercedes-Benz E55 AMG". Car and Driver. Retrieved October 26, 2016. ^ Robinson, Peter. "Mercedes-Benz E55 AMG". Car and Driver. Retrieved October 26, 2016. 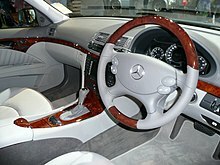 ^ "Mercedes-Benz E55 AMG". Car and Driver. Retrieved 2018-09-27. ^ "Mercedes-Benz AMG 6.3-liter V8". Insideline.com. 2005-07-19. Retrieved 2010-07-28. ^ "Behind the Scenes: Mercedes-Benz E55 AMG" (PDF). December 2002. Retrieved 2010-07-28. ^ May 2003 BY TONY SWAN PHOTOGRAPHY BY AARON KILEY (2012-08-22). "2003 Audi RS 6 vs. BMW M5, Jaguar S-type R, M-B E55 AMG Comparison Tests – Page 3". Car and Driver. Retrieved 2012-08-30. ^ Hong, Patrick. "Power Trip - 2003 Audi RS 6 vs. 2003 Mercedes-Benz E55 AMG". Retrieved October 26, 2016. ^ Kiino, Ron. "Mercedes-Benz E55 AMG Wagon". Retrieved October 26, 2016. ^ "Beautiful, But Horrible: 2003–2005 Mercedes-Benz W211 E-Class". CLUNKERTURE. ^ "Mercedes-Benz presents the new generation E-Class at the New York International Auto Show 2006". PRESSPORTAL. 2006-04-12. ^ "2004 Mercedes-Benz E55 AMG Test Drive". Cars.about.com. 2011-06-16. Retrieved 2012-01-06. ^ February 2007 BY TONY SWAN PHOTOGRAPHY BY DAVID DEWHURST. "2007 Audi S6 vs. BMW M5, M-B E63 AMG Comparison Tests – Page 4". Car and Driver. Archived from the original on 2015-12-22. Retrieved 2012-08-30. ^ "Mercedes releases performance pack for the E 63 AMG". Autoblog.com. ^ "Mercedes-Benz UK". Mercedes-benz.co.uk. Retrieved 2012-01-06. ^ "Mercedes-Benz Germany". Mercedes-benz.de. Retrieved 2012-01-06. ^ "Mercedes-Benz USA". Mbusa.com. Retrieved 2012-01-06. ^ "For safer cars | Mercedes Benz E Class". Euro NCAP. Retrieved 2009-12-05. ^ "IIHS-HLDI: Mercedes E class". Iihs.org. 2008-11-25. Retrieved 2009-12-05. ^ "IIHS-HLDI: Mercedes E class". Iihs.org. 2009-11-03. Retrieved 2009-12-05. ^ "2007 Mercedes-Benz E-Class Safety and Crash Tests". Autos.msn.com. Retrieved 2012-01-06. This page was last edited on 21 March 2019, at 01:17 (UTC).